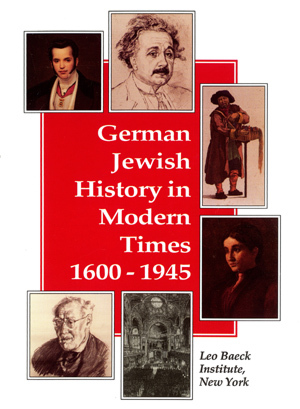 In 1996, Columbia University Press published the first of four volumes of German-Jewish History in Modern Times, a comprehensive historical survey of the Jewish presence in Central Europe beginning in the seventeenth century. Sponsored by the Leo Baeck Institute, the project has become a standard work that offers vivid portrait of Jewish History in German-speaking lands through the periods of emancipation and integration, and the Holocaust. Under the editorship of Michael A. Meyer (Hebrew Union College), eminent scholars consider a broad range of topics: religious and cultural life, demographics, political, legal, and socioeconomic status, relations between Jews and non-Jews, and Jewish participation in the larger context of European history. Leo Baeck Institute adapted this brief synopsis from the work for free use by educators and the interested public.